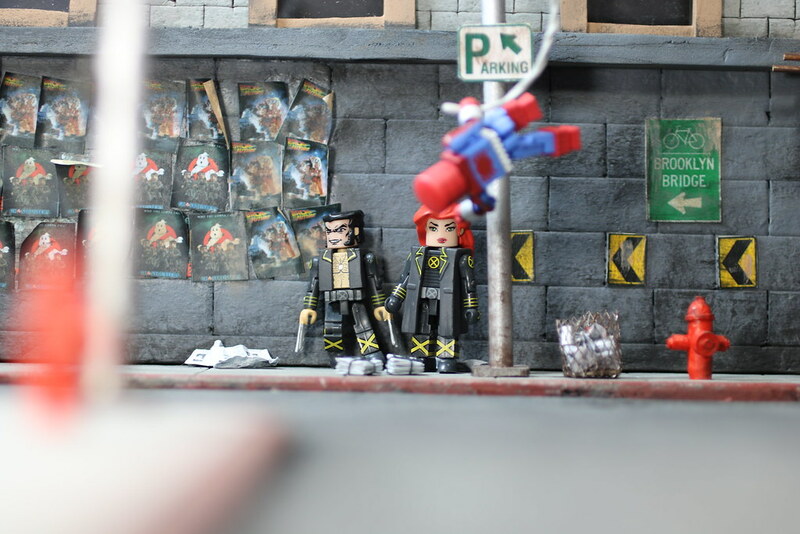 We will continue looking at MiniMates today. They are on my mind, since I have immersed myself in the scale to try and make a quality diorama for them, which I have never had before. Now it is time to look for some vehicles. 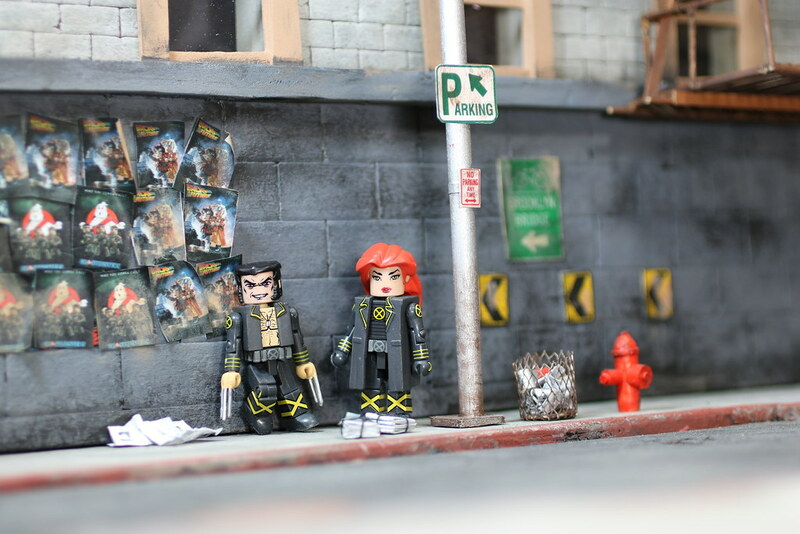 The scale of MiniMates is between 1/35th and 1/24th scale. I some 1/24 scale models around, and they are a bit too tall for MiniMates. I do not have any 1/35 scale cars to use. But I do have Transformers, and plenty of Transformers. I figured, why not look at the newest of the lot. 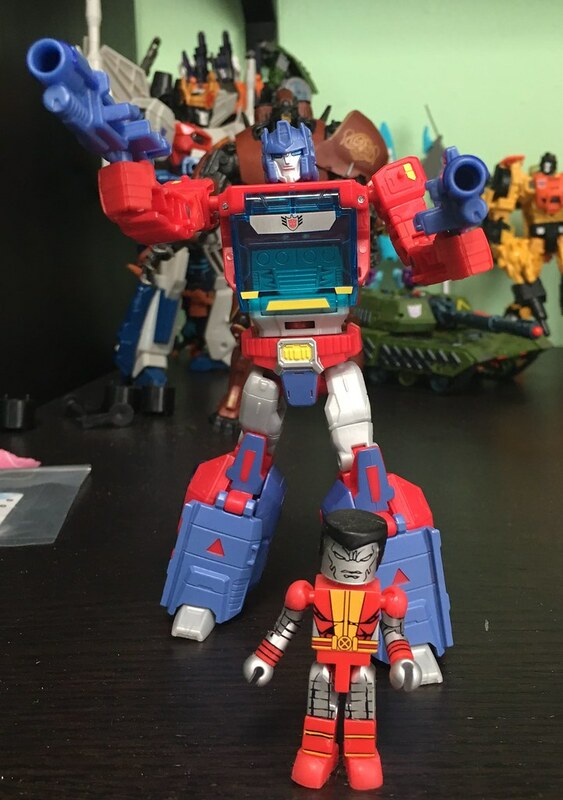 The Titans Return figures. As a vehicle, a Titans Return Deluxe Class figure works fine. 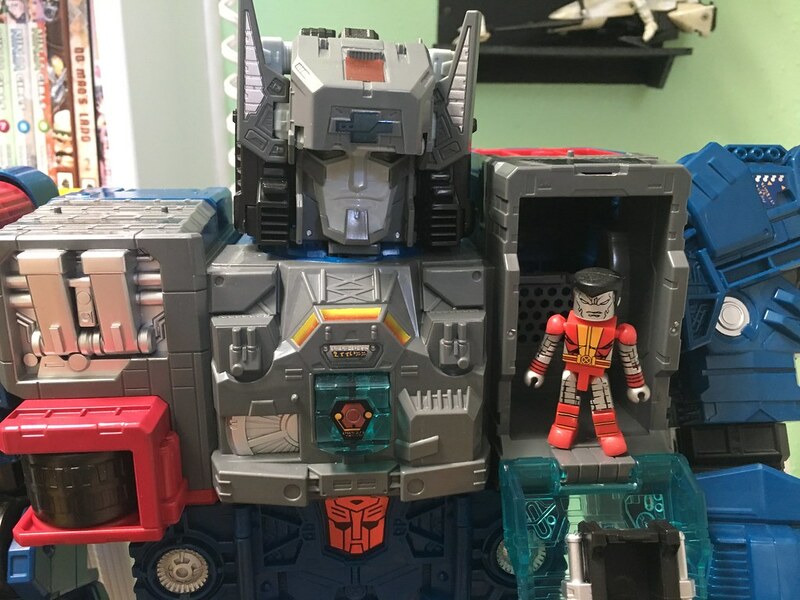 The cockpit is too small, since it is made for a Titan Master that is about half as tall as a MiniMate. Too bad, no going for rides in the cabs of these vehicles. But from the outside, they work quite well. Comparing the robot mode, this works well too. This could be the start of some pretty fun photography. And as you continue to increase the scale of the Transformer, it works better with MiniMates. 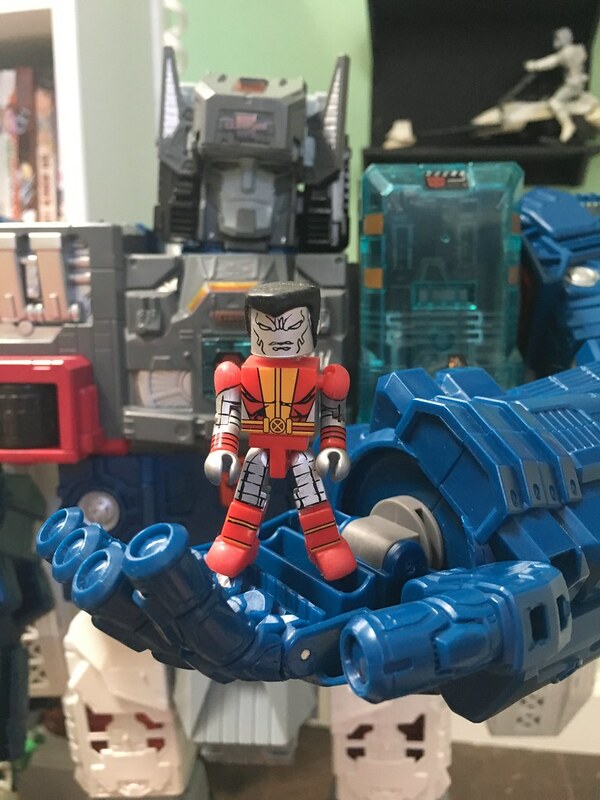 It is a good thing Colossus didn’t attack Fort Max, thinking he was a Sentinel. Deadpool. One crazy guy, that made a huge splash outside of the comic world with a movie that was a huge success. People in the know have loved Deadpool for years. For me, he was in and out of comics that I read. I knew who he was. I knew he had a loud mouth and great jokes that could rival Spider-Man. It wasn’t until more recently that I started to get the collected volumes to really delve into the character. And boy does this not disappoint. Now we have the figure. 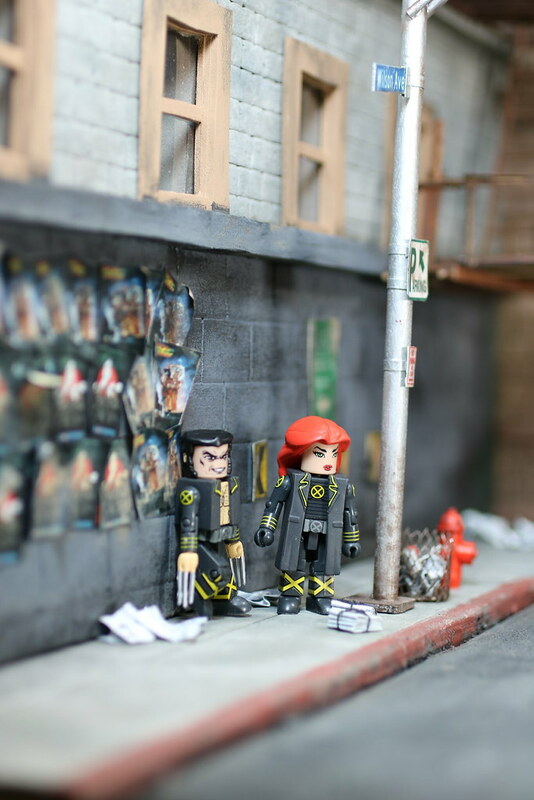 Part of the X-Men series, since he wants to be an X-Men over almost anything else. What do we get with this figure? First and foremost, we get a fantastic figure. We get some nice new body parts. The forearms and the shins are both covered in armor. He has a great head sculpt that gives a wonderful expression. And he comes with a few costume accessories that really add to the outfit, including the belt, shoulder holster for his katana blades, and leg holster for his gun. So, with such a great figure, how can we top that? Add in more accessories than I have ever seen come with one figure, and more than some waves have had over all of the figures combined. Let’s take a look at what we get. First off, a knife. I am sure if Deadpool is using a knife, he is out of options… like cutting off his own hand to get away. There is a sheath along the outside of his left leg to keep it nice and close by. Next up is a pair of guns. They look like they are Desert Eagles. A little small if they are, but fairly well done. They both have a holster, one on the hip, and one on the thigh. Yay for storage for your guns!!!! Next up, the pair of Katana blades. Can’t be Deadpool with out going into a gun fight wielding a pair of swords. They look great. They were nice and straight out of the box, and fit nicely into the sheaths running down his back. Then we get a little crazy. A rocket launcher with punching fist. This is the same rocket launcher we got with The Punisher, but without the boxing glove. Thankfully, if you want a more serious tone, the boxing glove is removable. 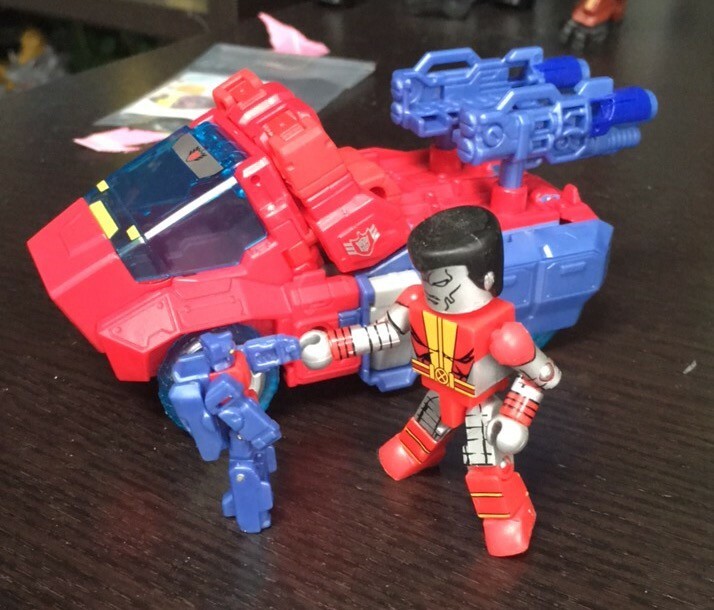 The rocket launcher pegs into the hole in his back. We get a couple of extra weapons. One is a repaint of the shotgun that came with The Punisher. This time around, it is a much better silver color. The other gun is a futuristic rifle. It makes me think of the Kree storyline where Deadpool was pretending to work with them while he was actually working on destroying them. These guns are extra, and do not have a place to be stored on Deadpool. I am thinking some straps need to be added, because Deadpool needs to go into battle with every weapon that is not tied down. Finally we get an alternate head. 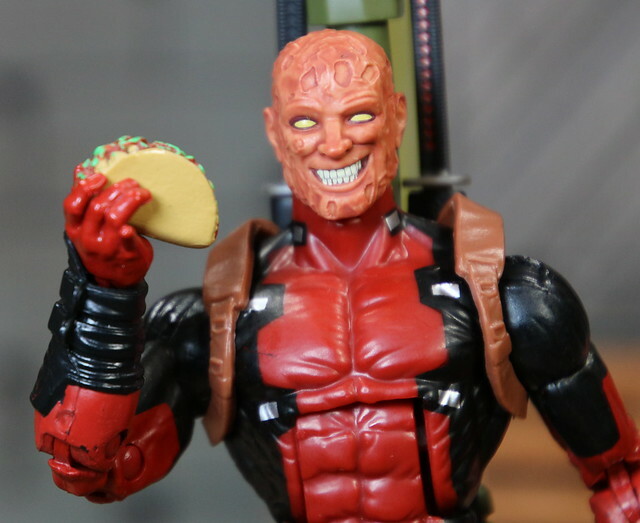 We need an unmasked head, because how else is he going to eat that taco he also comes with? The head looks horribly great. He is no doubt a burn victim of some sort. The smile is well done, and shows he cannot be kept down by that ugly face. This figure is great. No wonder it took me so long to get my hands on. Everyone and their brother wanted this figure. It was an additional figure to the wave, so it did not come with a BAF part. Instead they filled every part of the box with some kind of death instrument. What fun!!! 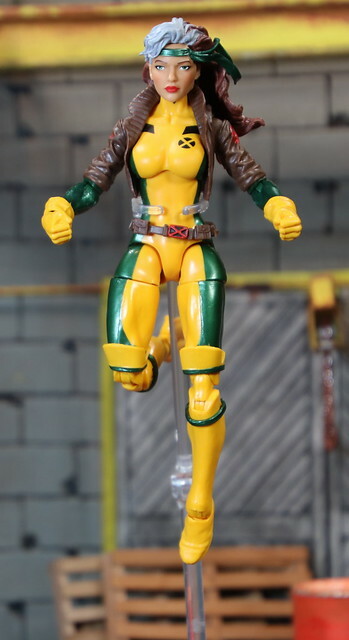 As I continue on the back half of the Juggernaut Series, we come to one of the most anticipated figures in this series, Rogue. She is decked out in her classic green and yellow outfit with the brown leather flight jacket. She looks like her 90’s amazingness, from the well designed outfit, to the fantastically big and poofy hair. Earlier we looked at Phoenix, and she suffered from a giant, heavy blob of hair. 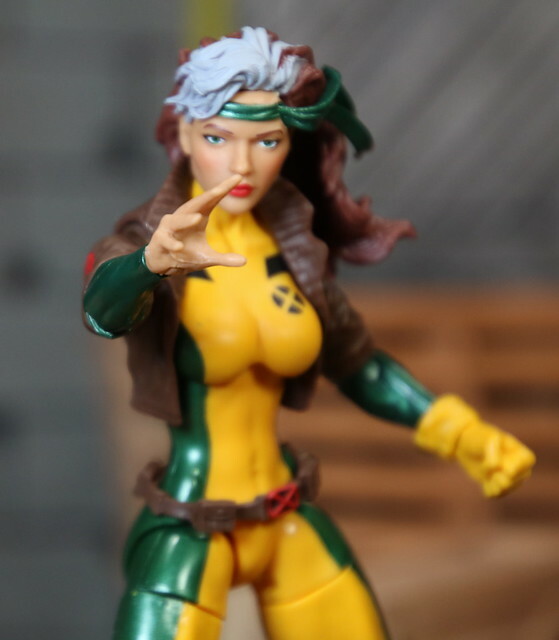 Hasbro went a different way with Rogue, and actually sculpted a fantastic head of hair. Not only does it look great, but it is also fairly light. So, it shows Hasbro can do big hair well, they just didn’t do it with poor Jean. 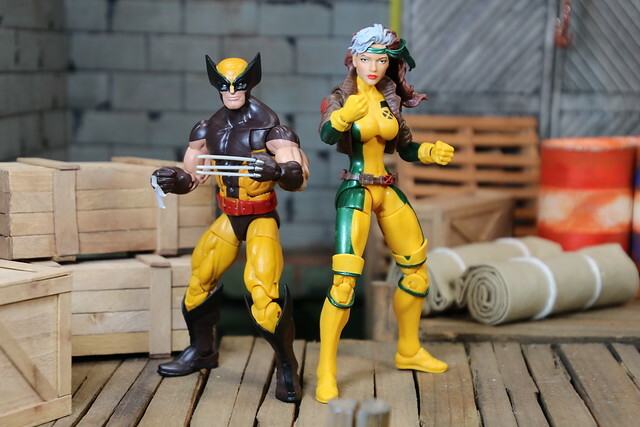 There was a lot of talk before Rogue came out, so I am sure this is one of the figures they really didn’t want to mess up. Her outfit looks so good. The green is shiny and metallic. The yellow is flawlessly painted. She is wearing her iconic short gloves and long boots. Her boots are a little bit of a wild card. There are two added parts, the top of the boots on her thigh, and the green piping around the bottom of her knee. These two pieces are loose, and do not always stay in place. They can probably be glued into place, as they do not hinder the double knee joint. I just haven’t gotten around to it yet. She comes with one accessory. It is her bare hand. We have seen this open hand a number of times on lots of ladies, but this time it just works very well. She has been know to take off her glove to steal powers, so that is a great add to the figure. Overall, this is an outstanding figure. She looks great. They picked the right costume to use. She has a great body buck that allows for great posing. I don’t know of anything I would change on this figure. She is very well done.